The incredibly detailed Mortal Kombat Series 1 Scorpion 7-Inch Action Figure features Scorpion in his current timeline outfit in the Mortal Kombat XI video game. The figure comes with a base, two ninja swords, and a kunai spear. The mask is interchangeable with other Scorpion figures (sold separately). The figure has 22 points of articulation and comes in a Mortal Kombat themed window box packaging. A leader in the iconic faces for the Mortal Kombat franchise, Scorpion is the alias of Hanzo Hasashi, formerly one of the finest warriors of the Shirai Ryu, a Japanese ninja clan. 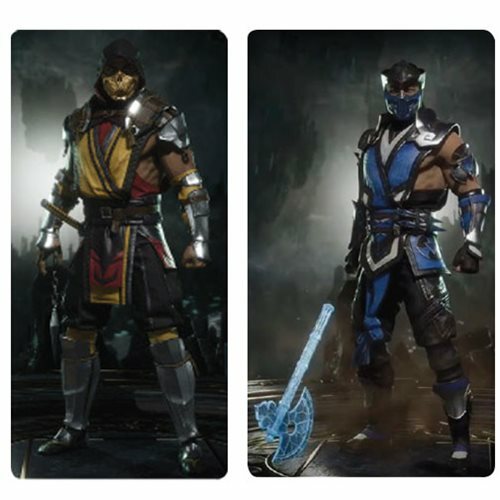 After he was killed by Sub-Zero, a member of a rival clan of Chinese assassins known as the Lin Kuei, Scorpion became a hellspawned revenant residing in hell (later the NetherRealm) and seeking vengeance against those responsible for the destruction of his clan and the death of his family, including his wife and his son. Although essentially neutral in allegiance, Scorpion will join forces with anyone who can assist his plans of revenge. The incredibly detailed Mortal Kombat Series 1 Sub-Zero 7-Inch Action Figure features Sub-Zero in his outfit in the Mortal Kombat XI video game. The figure comes with a base, two Ice axes, and frozen head with spine. The figure has 22 points of articulation and comes in a Mortal Kombat themed window box packaging. Another leader in the iconic faces for the Mortal Kombat franchise, Sub-Zero is a formidable fighter possessing the innate ability to control ice in many forms and whose defining character trait is his fierce rivalry with his nemesis Scorpion. In his first return appearance in Mortal Kombat II, it was revealed that the original Sub-Zero had died during the events of the first game (at the hand of Scorpion) and was replaced by his brother. In thesubsequent games, the younger brother of Sub-Zero, remained as Sub-Zero, while the older brother became the wraith Noob Saibot.